The Upper Mustang Trek bring in to the forbidden of Kingdom (hidden valley) would be part of the Tibetan empire and is therefore closely tied. Mustang trek is an exploration of the hidden valleys of Upper Mustang, nestled between Tibet and the Himalayas – a place different from the rest of the world. The walled city of Lo-Manthang used to be a part of the Tibetan Kingdom of Gungthang until the 1830s. The early history of Lo-man thang is embellished in myths and legends rather than recorded facts. Even though Upper Mustang is changing it still surprises the visitors with its stunning vista and the stubborn way it clings to its unique culture. Crumbing artworks are slowly being restored further enhancing the beauty of this region. Crumbling monasteries have been rebuilt and filled with the sound of shaved-headed children in robes studying ancient Buddhist ways and teachings. There are around 275 houses in Lo-Mangthang with four castes: the royal caste, the everyday folk, the blacksmiths and the butchers and millers. The royal palace roof has solar panels on it nowadays, along with a small herb garden of various holy decorations, flapping flags and of course stacked firewood. There was a time when it was mandatory for certain families to supply the firewood for the royal family. Sky burial and polyandry are still remaining cultural practices in the Upper Mustang region. 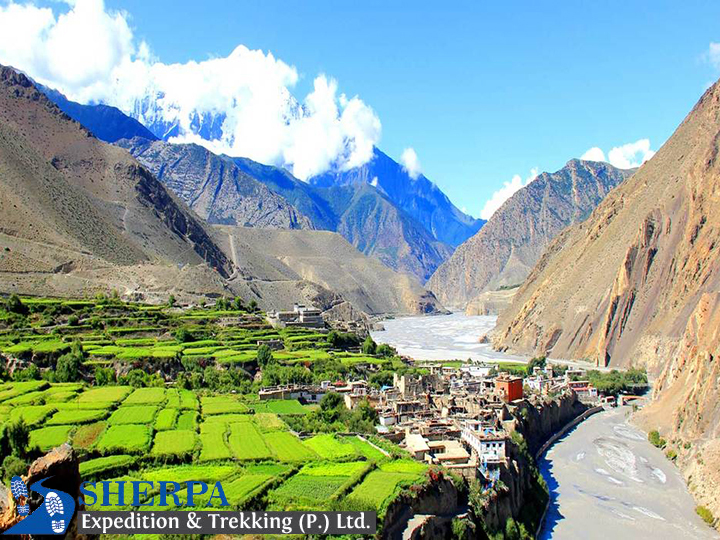 Upper Mustang trekking is a once in a lifetime destination where you can explore the fascinating medieval walled kingdom. Highlights of Upper Mustang Trek. The ancient of Lo, Upper Mustang is one of the last places in Nepal with Tibetan Buddhist culture. Wonderful landscape these are identical to the Tibetan village. Include your trip during the Tiji festival, the festival celebrated in Lo- Mangthang is to pray for peace to concern evil. Unveil pre-historical culture by viewing a mysterious cave, cave temples are known for thousands of years old monasteries. Welcome by Sherpa Expedition and Trekking representative at the Tribhuvan International Airport and transfer to hotel in Kathmandu. Day 2: Kathmandu to Pokhara overland Journey. Assist by a guide to transfer from Hotel to Tourist Bus Departure place at 06:00 Hrs and about 6 hours journey toward Pokhara where overnight accommodation with BB Plan is arranged. Day 3: Transfer to airport fly to Jomsom and trek to Kagbeni. Our guide assists you to transfer for Pokhara Airport to fly for Jomsom. This scenic adventurous flight takes about 20-25 minutes passing through the world’s deepest George presenting spectacular mountain views of Mt. Dhaulagiri, Annapurna Ranges and Fishtail with several famous peaks within the Annapurna and Dhaulagiri area from its both sides. The airstrip is in Jomsom, the main village in the Kali Gandaki valley. Jomsom is the beginning point of our trek. After landing here we start our trek toward Kagbeni which takes about 3-4 hours walk. Kagbeni is also the checkpoint for entrance to restricted Upper Mustang Trekking. We can enjoy the majestic view of Mt. Dhaulagiri, Nilgiri and Tukuche peak while walking the trail in the opposite direction. Your overnight accommodation is set here in tented camp/tea house/Lodge. Day 4: Trekking from Kagbeni to Chele. After the formalities of showing your restricted area trekking permit in Kagbeni, we start our trekking early because in Mustang there is heavy wind which gets up later in the day, blowing dust and sand around. In the route, we can see Nilgiri glowing orange in the first rays of the sun. We take the western route, following the east bank of the river until we reach the end of a broad valley Chuksang, where we cross the Kali Gandaki. After Kagbeni, the trail climbs up, giving us a good view of the village, the valley, and Nilgiri. At first, the path follows the river closely and later it leads eastwards to flat dry, desert-like land. Here the scenery is amazing and very characteristic of Mustang with red sandstone pillars and rock formations with fantastic forms and colors, formed by thousands of years of erosion. The first main village we reach, Tangbe, has red and whitewashed houses and on the other side of the river from here are caves, perched high in a vertical wall, which were believed as habitations in previous times. Chaile appears as a small white dot at the end of the canyon. The trail towards here descends gradually to the river-bed – this area is well-known for its fossils. The wide valley ends abruptly at a vertical cliff and a bridge crosses the Kali Gandaki, which flows through a natural tunnel in the cliff. The valley narrows further north and a steep trail leads us up to Chele, which is a small town with good views towards the Himalayan ranges. Our tented camp or tea house accommodation is set here in Chele for today. Day 5: Trekking from Chele to Shyangboche. Today’s trek begins with a steep climb as we follow the trail westwards and when we see Ghyakar on the opposite side of a deep canyon the trail turns right, following the gorge. Running high up above the path is gouged out of the rock and descends in an almost sheer drop for more than 100 meters. After about one hour we are on a pass offering a good view towards Samar, the Kali Gandaki valley and snow-capped peaks in the distance. After Samar we cross a side-valley, descending to its base and crossing over a creek before we trek all the way up again on the other side. About two hours from Samar is a red painted cave monastery, which looks as if it has been stuck on to the vertical wall. This is Ranching chorten, one of the most sacred places in Mustang. The name means ‘the chorten that formed itself’ because inside are two large stalagmites in a chorten-like formation. Two famous Buddhist teachers, Padmasambhava and Atisha stayed in this cave centuries ago. There are prayer flags on the ceiling and pilgrims have left small clay figures inside. The trail goes through a forest of small trees and green bushes which are able to survive in the narrow gorge because the high vertical walls keep them cool and sufficiently moist. Soon the valley broadens out and we can see walls built in front of caves which are temporary homes for the herders whose animals graze here. Sometimes it is possible to see the rare blue mountain sheep in this area. The walk to Shyangboche can seem never-ending. It is fairly easy, but a constant climb with the destination nowhere in sight, until, finally, a cluster of houses appears. It is much colder in Shyangboche, the overnight halt for us today. Day 6: Trekking from Shyangboche to Ghami. Within 15 minutes of the start of today’s trek, we have already negotiated the first of today’s three high passes, Yanda La, and passed a distinctive red chorten painted with Buddhism’s eight auspicious symbols. A terraced valley with groups of yellowish trees appears and above the village of Ghelung are two red Gompas. Unlike other villages in Mustang, where the houses are built close together and look fortress-like, Ghelung is spread out wide on a patch of green grass and gives the impression of being a fairly affluent little community. Rising above the village are barren, brown hills and we can see the Nyi La pass straight ahead. The path descends gradually towards the Ghami La pass and on the way, we see a rundown, deserted village downstream. By now the landscape is even more rugged – a deep riverbed has snaked its way down from the red cliffs and immediately ahead are hills which have the outline and color of enormous sand dunes. Another broad valley comes in from the left-hand side and in its center is Ghami, Mustang’s third largest town, which is high above the river and surrounded by fields. Day 7: Trekking from Ghami to Tsarang. Outside Ghami we see what is Mustang’s longest Mani wall – approximately 1000m long and decorated with simple carvings, blending in well with the surrounding scenery. There is also a group of chortens standing in front of the red wall which forms the end of the valley. Again, the architecture here is like an organic extension of nature. According to legend when the famous Guru Rinpoche (Padmasambhava) came to the area and fought and destroyed a demon, its intestines landed at the site where the Mani wall stands, its lungs near the red cliffs behind and its heart at the spot where Mustang’s oldest monastery, Lo Gekar, was built. A steady climb takes us up a 3820m pass, after which a lunar-looking desert stretches to the horizon. There is no sign of vegetation or human life here, only barren hill after barren hill with the same distinctively creepy beauty. The first indication of human presence we see next is the Tsarang chorten – the large red-painted Stupa is in the middle of the landscape and further down the monastery and the palace of Tsarang can be distinguished in the fields. A broad road leads to Tsarang, Mustang’s second town, with around 1000 inhabitants. Day 8: Trekking from Tsarang to Lo Manthang and Explore. Today’s trekking begins on flat terrain and the view, apart from a chorten and a few caves are unrelieved barrenness. After crossing a pass and waking through two rocks forming a natural gate we have finally arrived at Lo Manthang. Day 9: Trekking from Lo Manthang to Tamar. We walk up through pastures studded with juniper and have the chance to look back at Lo Manthang. Our return route is on the same side of the Kali Gandaki because the eastern part is even less inhibited, more strenuous for walking and drinking water can be hard to find. Gradually we say goodbye to the Lo Manthang plain (sometimes known as ‘The Plain of Prayers’) and after about two hours there is no sign at all that such a gem of a city is concealed in one of those rocky valleys. In front of us, the mass of the Himalayas reappears and we negotiate the highest pass, Lugri La (4200m). Leaving the monastery, we have a short but steep walk down the yellow canyon to Tamar, seeing fields in the southern and western part of the valley and large red vertical cliffs in the North West. After our time in such a very barren landscape with little in the way of color contrasts, the combination of red rock, blue sky, green grass, and white yaks seems very intense! Above the village are numerous caves, but their entrances are only accessible to rock climbers. At the entrance to the canyon is an unusual looking chorten – the top looks like a bush because of the hundreds of prayer flags woven into it. Around the chorten are hundreds of erected stones. Day 10: Trekking from Tamar to Shyangboche. With Nilgiri visible again, we walk past more caves on our way south and then there is a gradual hill climb bringing us above Ghami, where we can see the town, the long Mani wall and the pass we climbed five days ago! There are two more passes to cross and splendid views of the Annapurna range. Next, we reach Jamyung, at the fork between Ghelung and Shyangboche. We can detour to Geelong, with two Gompas built above the village and a small but fine monastery. Later we rejoin the regular trekking path to Shyangboche. Day 11: Trekking from Shyangboche to Teatang. The direct trail to Samar runs high above the canyons and with each side valley we cross, the Annapurna range appears closer and closer. Parts of this section of the trek are quite tough-going, because of the gorges, but the compensation is the brilliant views of Tilicho and Nilgiri. As the mountains start to appear higher and higher and the vegetation increases there is also a great contrast with the walls of ice. Such subtle variations in color after the ‘moonscape’ bleakness are a refreshing change. We cross two deep valleys before taking a lunch break at Samar and then the second part of the day is a relatively easy downhill walk. When Gyakar appears, the route becomes more spectacular, running high above the gorge. We can take a break in Chile and then we arrive at the riverbed of the Kali Gandaki region –and reach Chuksang. Although we are on the same route we hiked along a few days earlier, it will probably feel like much longer ago, the sense of time seems to change when trekking! Soon we are at Tetang’s mani wall and beautiful chorten, which has two of the auspicious symbols painted on each side. Day 12: Trekking from Tetang to Muktinath. After an early start, we have a good view of the village of Tetang, which consists of two separate settlements surrounded by high walls and from a distance looks like a large fort. The ascent to a plateau is steep and the trail here can be rather difficult to locate. There is an easy walk over a plain, after which comes about three hours of steep walking uphill, with the narrow trail getting precipitous at times, with loose black gravel. After ascending high in the valley the trail makes a right turn and the pass becomes visible above. At the pass, the mountains seem amazingly close, with Thorung, although the lowest peak, looking particularly impressive, having large glaciers clinging to its steep flanks. Tilicho is covered by snow with indented glaciers, while the summit of Annapurna further back does not actually seem as high as its 8000m +. Even Nilgiri’s almost sheer north face is also covered by glaciers. It is a moderate walk down to Muktinath, with stunning views of Dhaulagiri and Annapurna. Their summits are only 34km apart, which accounts for the tremendous depth of the Kali Gandaki valley. Getting to Muktinath involves crossing another valley, which takes some time. The sporadic houses start to become more numerous as we get nearer Muktinath. There are 108 springs which have their source in or around Muktinath and bathing here is believed to bring good luck. Many people also collect spring water in bottles to take home to relatives. Also at Muktinath is the legendary flame coming out of a rock, around which a Buddhist temple has been created. Day 13: Trekking from Muktinath to Jomsom. As we begin the final day’s hiking, Dhaulagiri glows orange and the yellow in the early morning sun. Today we take a side trip to the Bon Punt soling monastery in Lubra, before returning to Jomsom for the flight back to Pokhara. The trail is rather sporadic. From a small hill, the views of Muktinath are good and it is plain that much of the valley is used for agriculture. 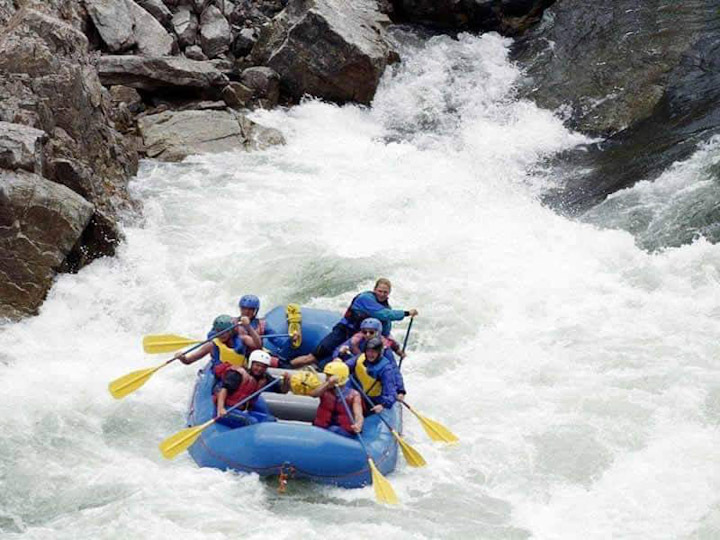 We soon reach the Panga Khola valley and the track follows the course of the river, but high upstream. We have to cross the river and walk downstream on the other side, which seems like a major detour but is necessitated by the steep cliffs further down. After a steep ascent and descent, we come to an area of pine forest – a surprising change of scenery! We are high above the river again and must cross two bigger side-valleys on the way downstream. Eventually, we come to some fenced-in fields and a garden with apple trees, near Lubra’s village school. The settlement of Lubra consists of about 20 houses near a bend in the river and was founded in connection with the establishment of the Bon Punt soling monastery in the 12th century. This is one of the very few Bon monasteries remaining in Nepal. Bon was the predominant religion in Tibet before the spread of Buddhism and is also called the fifth tradition of Tibetan Buddhism. In the monastery are pictures of four Lokapalas and Buddha Shakyamuni. Bags of masks hang from the ceiling. It is still the tradition today that the head member of Lubra’s nine major families automatically becomes a priest. After Lubra, the trail leads to the Kali Gandaki and we have to leap across the river Panga a couple of times! At the confluence of the two rivers, we join the caravan of tourists going to Jomsom. Day 14: Fly from Jomsom to Pokhara transfer to Hotel and Explore Pokhara. Day 15: Tourist Bus from Pokhara to Kathmandu. After having breakfast your trip starts by a drive back from Pokhara to Katmandu by tourist Coach about 6 hours driving (or take a short 30-minute flight) and overnight is arranged in Kathmandu as per agreed category with BB Plan. 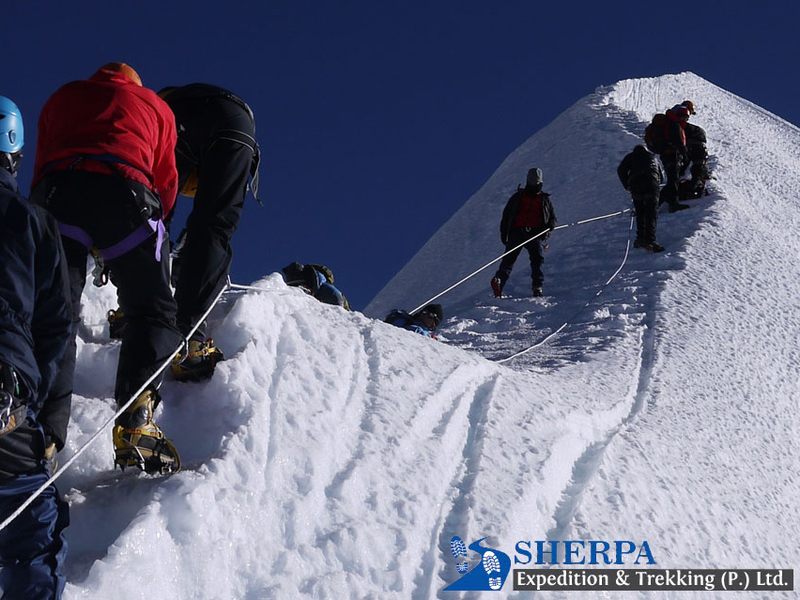 At evening Sherpa Expedition and Trekking, Private Limited invites you to join in a farewell dinner in a typical Nepalese cultural restaurant. Day 16: Final Departure to your port of Destination. We are saying goodbye as your journey to Nepal comes to an end today! Approximately 3-4 hours before your scheduled flight our representative will take you to the airport. On your way home you'll have plenty of time to plan your next adventure in the wonderful country of Nepal. Airport - hotel -airport picks up and drops by private vehicle in Kathmandu. 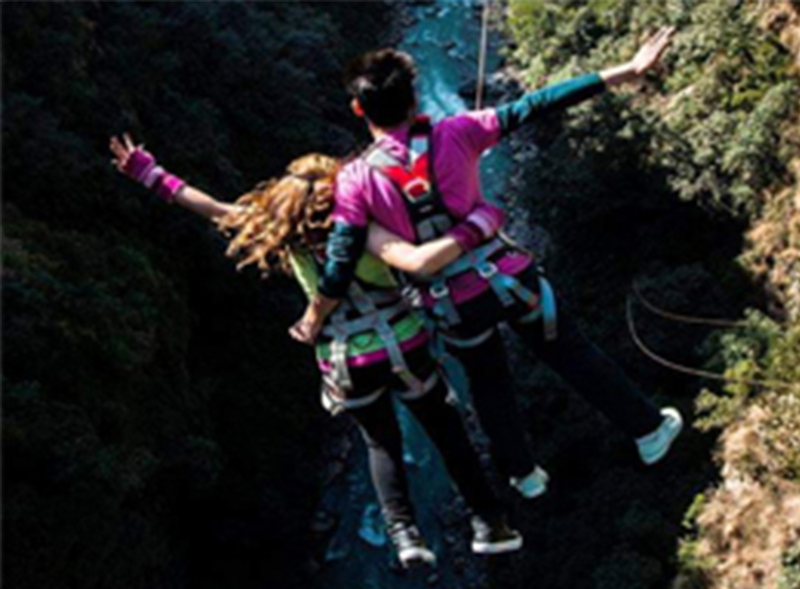 Three Star Category hotel in Kathmandu and Pokhara on Twin Sharing Basis on BB Plan. Meals on full board (Breakfast, lunch, and dinner) during the trekking period. Best available accommodations during the trek in Teahouse. Trekking porter /Sherpa to carry your bags during the trekking 2:1, max 15 KG baggage/porter. 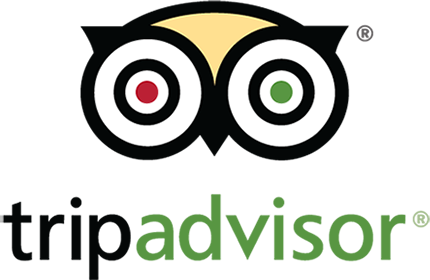 Food, drinks, accommodation, insurance, salary, types of equipment, transportation, local tax for Guide and porters. Ground transportation by Tourist coach from Kathmandu to Pokhara -Kathmandu. A private vehicle from Nayapul to Pokhara after trekking. first aid kit. All necessary paper works and Annapurna conservation entry permits special permit (ACAP fees). Nepal entry visa fee. Tips for trekking staff and driver. (Tipping is expected but not mandatory). All kind of drinks (hot, cold and alcoholic) Personal shopping and laundry, etc. In cities like Kathmandu and Pokhara accommodation will be in a 3-star category hotel. 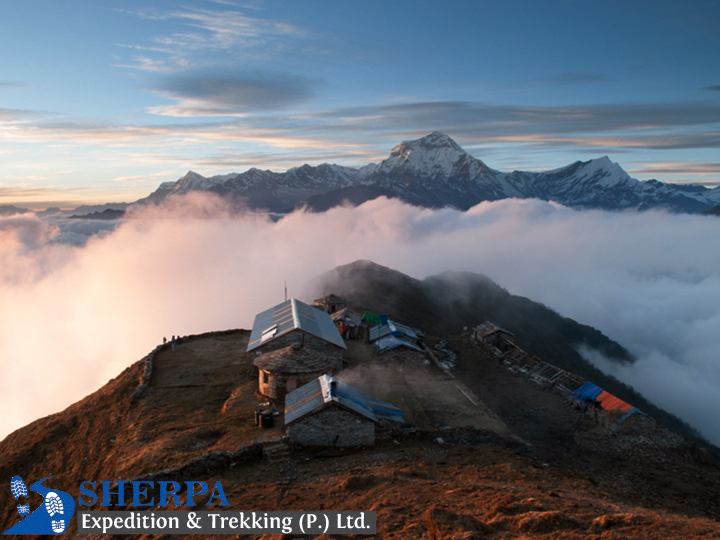 While on a trek, you will be accommodated in teahouses or lodges. The accommodation can be pretty basic except for a few villages as teahouses of this trail started only a few years back. Despite having relatively basic rooms and less facility, teahouses of this trail offer you the best possible services. Lodges with twin sharing rooms with clean common toilets are to be found often during the trek. Your first meal of a day starts with plentiful western breakfast during your stay in Kathmandu and Pokhara. On the trek, teahouses provide you breakfast, Lunch, and Dinner. You have a variety of choices for food from local cuisine to International, generally, rice, noodles, spaghetti, egg, and macaroni are available. We highly recommend you to buy water purifying pills as you get to have stream water; however, you have an option of buying mineral water and boiled water at an additional cost. Note that, purchasing plastic bottled water is not eco-friendly. March till November is considered as the best period to trek to Upper Mustang. This trek is one of the few trekking routes doable even in monsoon season as the Upper Mustang region is on the leeward side, it won’t rain much so doing this trek in monsoon season is fine. Often trekkers travel during the month of May where festival like Tiji orTenchi is celebrated which happens to be a colorful festival for the people of Upper Mustang. 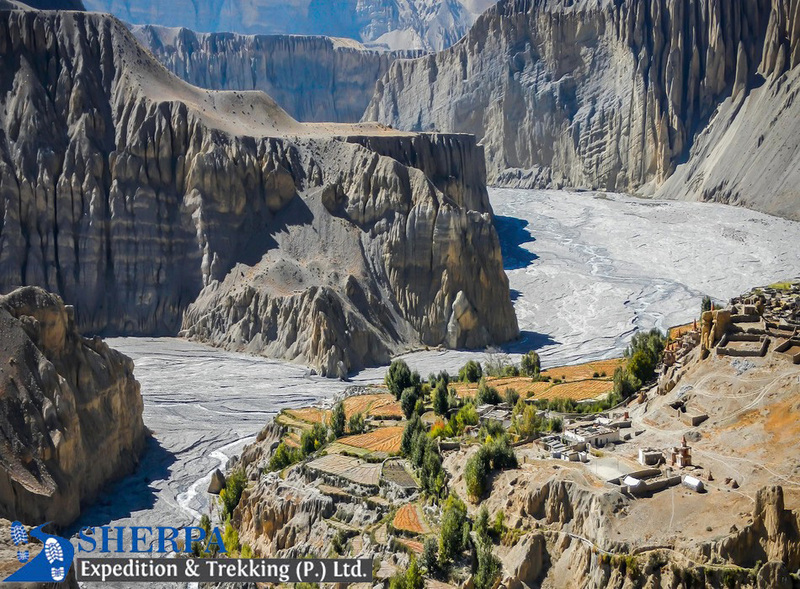 Upper Mustang Trek is a moderate trek suitable for all novice walkers and experienced trekkers but we recommend you to be prepared before embarking, regular exercises outdoor activities like swimming, cycling, jogging, makes your trek a lot easier, however, pass experienced is a plus.